I didn't plan to shoot another duck for this challenge! In fact this is the only duck shot I took which wasn't sharp and clear, but, this is my favourite shot so in it goes. At least I've got a different "star" this time, featuring a Coot rather than a Moorhen. Shot with a Lensbaby, none of the blurring was done in Photoshop. Cropped, boosted saturation (no? really?! ), some work on the contrast and a touch of sharpening. Congrats on your 4th place this is just beautiful! This was one of my top five favorites in this challenge. Congrats on a top 5 finish! Sorry - voted this too low without much time for revisiting. I like this more than I've indicated. No doubt this one was right up there. Nothing more to say other than beautiful and congratulations on a fantastic entry. This was my favorite in the challenge. Someone just showed me the lensbaby website yesterday Great to see that this one was done with it. you got any more taken with it? this was one of my top picks in this challenge, congrats on the 4th, good job. Happy to tag behind this beautiful image. Congrats on your 4th finish in this great competition. This has a really 'dream-like' feel. I love the colors! Image critique: appropriate subject for the technique. Strong, emotive colour and not too blatant post-processing. Nice composition. Out-of-challenge appeal: yes - I like it. Except for the bird, this is just a smear of colors without any way to tell what you were photographing. This approach would be more effective if the colors were more pleasing to look at (the existing colors would work if there was less green) or if the bird made up a larger part of the photograph. Ah the requisite duck, ever omnipresent in most challenges. Your artistic spin works very well and gives this a dreamy look. One of the stronger entries in this challenge for sure, and should do well. Indeed a beauty with soft flowing hues and silky all around with great wading. A very clever entry. bumping up. Did you use a long exposure zooming to achieve this? The reflections really do a great job of making this looked brushed on as oposed to photo captured. Two of my favorite colors. Great find! Colors are very magic. The image seems to "explode" as if you zoomed the lens. I don't think the wide white border is appropriate - but it is a great entry for the challenge subject. this is a true impressionist image... the colors, the lines and light.. congratulations, very well executed! Ahhh Monet lives and he does digital, lol! Beautiful work. I like the ethereal feel of this - I feel like I'm falling in to the image and drowing in that rich colour and the wonderful shapes of reflections on the surface of the water. There is just enough detail in the duck (but not too much) and in the water trail behind it to ground the image and to provide the compositional focal point needed. In my top 3 for the challenge. Is this a lens baby effect? Superb job in this challenge. Lighting and composition are perfect. My pick for a top 5 placing. Just a bit overdone for my taste. Still a very good shot. this is beautiful, just wish it wasn't so soft around the edges. the colors and lighting are outstanding. the overall image is just begging for a little more detail to keep the eye engaged for a bit longer. I really like the way you have mastered a painted feeling to this very colorful and Impressionistc picture. The subject is simple and yet very effective. 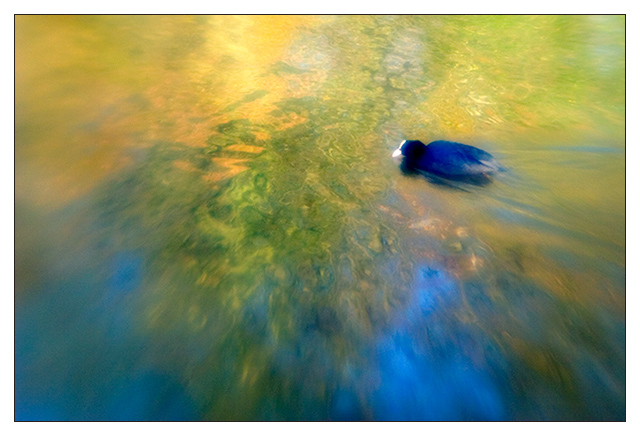 Very well done, the colors work well together and the movement of the duck draws my eyes to the center of the image. 9.
gotta love single element lens. lensbaby? Proudly hosted by Sargasso Networks. Current Server Time: 04/25/2019 11:03:59 AM EDT.